Stop by Payless to taste Pura Still Mandarin Orange, Blackberry, or Mango. You already love Jim Beam, come get a taste for some Jim Beam Black and Double Oak. Cheers! The Jeptha Creed Distillery is owned and operated by the Nethery Family and their 64-acre Farm. They grow almost all of the ingredients used in their spirits. Jeptha Creed has never been available in Indianapolis until now! Join us for a taste of Jeptha Creed Vodka and Moonshine. Learn more about the Jeptha Creed Distillery here. Your Crown Royal loving friends and family will save this forever! 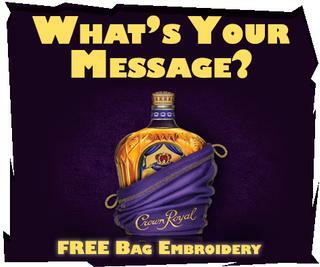 With every bottle of Crown Royal purchased you get to custom embroider the bag! A true keepsake and awesome present anyone would enjoy.